How do I get my hair to keep looking as good as it did when I left the salon? That’s a question many people ask. 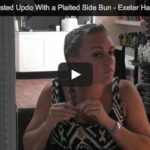 When you get your hair styled professionally by an expert hairdresser, like a stylist here in our Exeter salon, you’re getting the benefit of many years of hairdressing experience. Your stylist knows how to give you the perfect hairstyle, creating just the right colour and cut and using ideal products and styling methods. Most people aren’t professional hairstylists, and trying to maintain a style outside the salon can sometimes be frustrating and seem hopeless. After the first walk outside in humid weather or the first shampoo, the beautiful style that you were so proud of can seem like a distant memory. Here are some tips for maintaining your style, so your hair can look amazing every day. 1. Get a good cut. If you want to be sure that your hairstyle lasts, it’s imperative that you get a good haircut in the first place. Problems with style maintenance are most likely to happen when you get a bad haircut by a hairdresser that doesn’t understand how to deal with your hair type. They’ll try to force your hair into a style that’s all wrong for it by applying too much product. What happens when you wash your hair? The product washes off and you’re stuck with hair that’s out of control. You won’t have that problem if you get a cut at the Hair Boutique. Your stylist will give you a cut that suits your hair type perfectly, so maintaining your style doesn’t mean drowning it in product. Don’t be afraid to ask your stylist questions. If you like the way your stylist has got your fringe to highlight your cheekbones or has smoothed out the crimp below your chin, but you don’t understand how she did it, ask. Before you leave, ask about style alternatives – for example, for when you’re very rushed or when it’s hot and humid outside. 3. Keep your hair healthy. Use shampoos, conditioners and styling products formulated for your hair type. At the Hair Boutique, we sell a wide range of products, suitable for every hair type and every hair need. Your stylist can advise you on the products that are best for you. Ask your stylist how often you should wash and condition your hair. This will depend on your hair’s texture, how oily or dry it is, and how frequently you heat style. Once in a while, give your hair a break from blow drying, heat styling and tight bands and clips. When you do heat style, use heat protection. Use the right styling products, and use only as much as you need, so you don’t have too much buildup on your hair. Damaged, frayed ends can ruin your style. Trimming your hair frequently will ensure that your style still looks perfect. At the Hair Boutique, we want you to look gorgeous every day, not just the day you visit our salon. Make an appointment for a consultation and learn how we can make you look your best.